I have always loved Little Caesar’s Crazy Bread! They put the right amount of everything on them! Now you can make it yourself! Here is the Copycat Recipe for Little Caesar’s Crazy Bread! Here is the recipe for Little Caesar's Crazy Bread! Unroll the dough on a cutting board. Position it lengthwise (longer from left to right than top to bottom). With a sharp knife, cut the dough in half, and then in half once more so that you have 8 even strips of dough. Being careful not to stretch the dough, place each strip on a lightly greased baking sheet and bake for 6 to 8 minutes, or until the top just turns golden brown. While the dough bakes, melt the butter (on the stove or in the microwave on high for 15 to 20 seconds). Add the garlic salt and stir until it dissolves. Remove the browned dough from the oven and with a pastry brush or spoon spread a coating of garlic butter over each piece. Sprinkle a generous amount of Parmesan cheese on each! 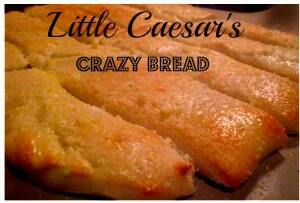 Enjoy your Copycat Recipe for Little Caesar’s Crazy Bread and let me know if you like it!!! !